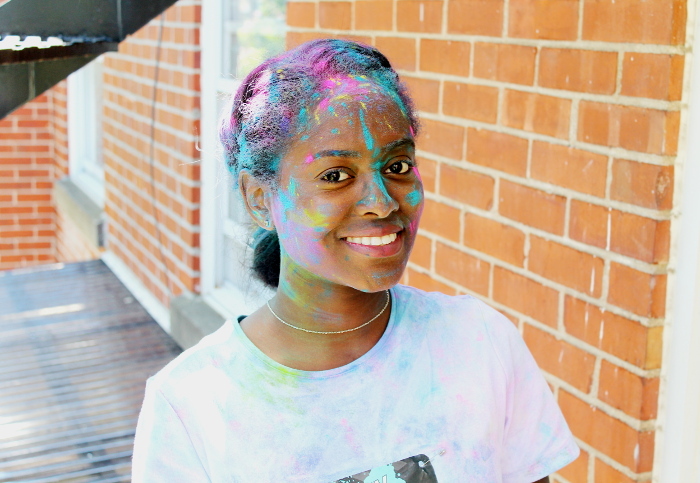 Guys, this was my first marathon experience AND my first color run! Well let’s just say that it was more like a color strut for me! I didn’t prepare myself at all for this and I kinda regretted it. I have this thing that I call “le pic pic” or “the hitch hitch” in English lol. It’s always hard for me to explain to people why I can’t run! It’s not because I’m skinny that I have great cardio, and le pic pic does not discriminate at all haha! You know when you’re in a hot station at the spa then get in the icy cold water? Sometimes you get that burning sensation on your skin! I heard it’s acid la Well the same thing happens when I walk or do cardio exercises for too long. It’s as if the pores of my skin open to release toxins. That ish burns and can literally make me cry. I usually have to stop moving until the feeling is gone, but this time I kept walking through it. I guess my brain eventually understood that I wasn’t about to stop until another 4,5 km so it gradually started to ignore the pain. Anyways being with my cousin and her friends and a bunch of happy people rolling themselves in colored powder, laughing and dancing, made it all worth it. I am definitely doing it again next year, and this time I will get in shape so I can at least run half of it. There are a few companies organizing these runs in several cities around the world. I definitely suggest you check them out and register with friends and family! Montrealers click here!